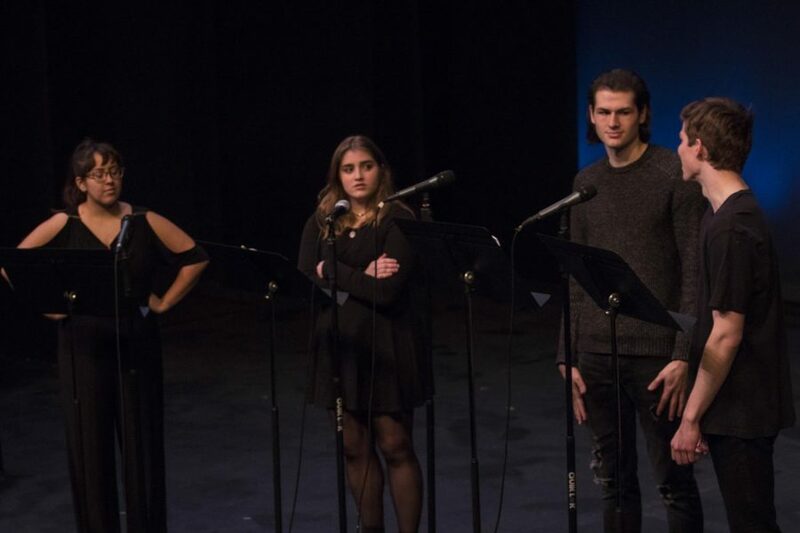 SPIN Theatre Company and the visual and performing arts department co-sponsored Luther’s first Student Directed One-Act Play Festival the weekend of Friday, April 5 through Sunday, April 7. The festival consisted of five student-directed productions. The plays performed on Friday and Sunday were “The Giver” directed by Artistic Director of SPIN Theatre Noah Tiegs (‘20), “The Man who Couldn’t Dance” directed by Cleo Garza (‘21), “The Last Cyclist” directed by Grace Huber (‘20), and “The Summer People” directed by Sophie Nall (‘22). They were presented back-to-back with 10-minute breaks in between performances. Students, faculty, and staff attended the four-hour long event. On Saturday afternoon, the festival also presented “The Matchgirl.” This show was directed by Mikaela Hanrahan (‘20) and Garret Baumler (‘20), was written by Matthew Espey (‘19) and Andrew Tiede (‘19), and the music was composed by John Kuntz (‘19). Each of the performances brought something unique to the festival, making the one-act experience much different than a stand-alone show, according to Tiegs. He highlighted that some were comedic while others were contemplative. “The Last Cyclist” is an allegory of the Holocaust, where cyclists are the primary target of mass-murder, meaning to be representative of Jewish people. This was followed by “The Summer People,” which told the story of a couple who had to deal with angry locals when they decided to stay two weeks longer at their summer home. “The Man Who Couldn’t Dance” explored masculine emotion through a dialogue between two past lovers. “The Giver” was adapted from the Lois Lowry novel of the same title, bringing new life to a well-known text. “The Matchgirl” showcased the work of several Luther students who adapted the larger play as a musical concert with minimal costuming and only music stands for staging. The festival also allowed student directors to lead in ways they might not be able to throughout the rest of the year. Tiegs thought this was a unique leadership opportunity. Putting students in charge of these productions offered artistic freedoms for everyone involved, not just the directors. Huber thought that the festival gave a stronger voice and opportunity for the student actors to incorporate their own ideas. Hanrahan agreed with Huber that collaboration throughout this process created strong bonds and performances. A steady audience came and went to support the festival performances, although attendee Ellie Palashewski (‘22) said that she was not immediately convinced by every artistic choice in the performances. The choices to which she was referring, such as costume changes that took place on stage in “The Last Cyclist” or the use of only music stands as staging in “The Matchgirl,” were appealing to other audience members. Tiegs hopes that the Student Directed One-Act Play Festival will take place again in the coming years.